Commercial Hvac | AllTech Services, Inc.
Commercial HVAC systems are designed, and function, differently than residential systems in a variety of ways. After all, they’re tasked with cooling more space than the average home, in most cases. Most commercial spaces also have unique cooling needs. For instance, you may need to keep computer systems or other important equipment from overheating. Overall, commercial HVAC systems require specialized care and attention, which is why it’s vital that you use a professionally trained Leesburg, VA, HVAC contractor. 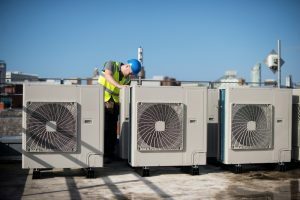 Our team often recommends rooftop commercial HVAC systems for businesses. These systems are comprised of multiple modular units placed on top of your commercial space. It may seem odd to put these outdoor units in a space where they’ll be constantly exposed to the blazing sun. However commercial systems are designed to handle such weather, and in return they off a number of benefits, which we’ve highlighted below.